100+ days. Capsicum chinense. Open Pollinated. Plant produces good yields of wrinkled Habanero type hot peppers. Peppers are extremely hot and turn from green to red when mature. Plant has green stems, green leaves, and creamy-yellow flowers. The peppers are round and have bumpy skin. It is so hot it is said to provide enough heat to spice up 7 pots of stew. 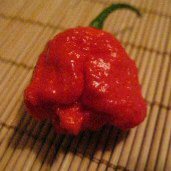 The Brain strain looks very similar to the Trinidad Moruga Scorpion pepper and is extremely hot. A variety from Trinidad & Tobago. Scoville Heat Units: 1,250,000.